Fenedy Mausavakalo put on a superb performance yesterday having missed many good opportunities for Amicale, he managed to get 2 goals into Tupuji’s net, at Port Vila Municipal Stadium yesterday afternoon. The ex-Tupuji striker who was transfered to Amicale late last year, has impressed a lot of football fans with his striking skills. Many fans said he has improved a lot this year. Kidston Billy scored the third and closing goal of the match 44 minutes before the end of the game. The Solomon import player, also had one opportunity to raise the score from a penalty awarded to Amicale, but his ball was deflected by Chikau Mansale. The national keeper, Chikau Mansale saved Tupuji from a lot trouble yesterday when he saved and deflected some good shots from going into Tupuji’s net. However, some fans and supporters who came to watch the match yesterday between Amicale and Tupuji went back a little dissatisfied over the match performance, especially of Amicale. After Amicale thrashed Tafea 5 goals to 0, a lot has been said about the club in the streets around Port Vila, but unfortunately they have not performed to some expectations yesterday at the Port Vila Municipal Stadium. Batram Suri and Kidston missed some very good opportunities too. “I apologise for not performing to everyone’s expectations today”, said Solomon veteran player, Batram Suri when he was interviewed by Vanuafoot after the match yesterday. Meanwhile, Tupuji supporters got frustrated over the referee’s decision for his ruling over one of the Tupuji’s player. “It’s not fair to get a red card for what he said to the referee”, said a Tupuji Imere supporter. According to FIFA Rule 12, a player can be sent off or shown the red card if he/she uses a foul or offensive language in the opinion of the referee. The match ended with 3 goals to 0 in favour of Amicale F.C. 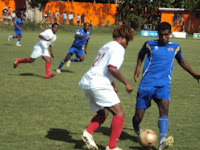 Amicale now is leading the PVFA classment with 27 points followed by Tafea F.C. with 20 points, Spirit 08 with 19 and Academy with 13 points. I have watched Tupuji Imere in the last couple of games they palyed. They have to improve their descipline in the field if they are to improve from their standings. Else I can only say, they still have a long way to go compared to Tafea, Amical, and Spirit 08. The Referee is 100% correct to Red Card a player if an offensive language is used during the game. That's a clear FIFA Rule, no one, even the Coach cannot conflict on that issue.